TOKYO, Japan, April 3, 2012 (ENS) – A Japanese travel agency is highlighting wind-powered EVs on a volcanic island in the Philippine Sea to create a tourist destination. Hachijyo Island about 300 kilometers south of Tokyo is where JTB Tokyo, a member of major travel agency JTB Group, is now directing visitors. But not before the travel company had set the stage. First, JTB Tokyo installed the wind power generator, then the travel company put in the EV charging facilities and made them operational. Then from November 2011 to the end of March, the company conducted verification tests of electric vehicles powered by wind. JTB Tokyo used rental EVs running exclusively on the wind-generated power to carry out EV test driving and monitoring tours intended for a questionnaire survey. Based on the survey results, JTB has verified that its community planning on Hachijyo Island, in which wide EV use is combined with local tourism, is right on track. Now, the company is scheduled to plan and develop new environment-oriented sightseeing tours for Hachijyo Island. 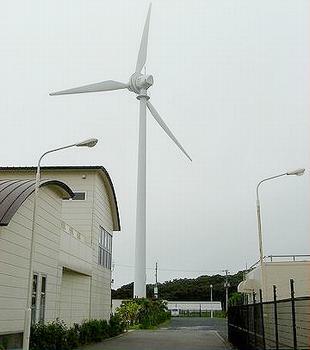 The new wind turbine, which generates power for the electric cars, is all part of the system that is certain to work as Hachijo registers strong wind on more than 150 days per year. For the scheme, Hachijo is introducing renewable energy to the island, including geothermal and wind power generation, to supply about one-third of the island’s electricity demand. The political will to expand this infrastructure as well as the electric vehicle fleet was confirmed by the mayor of Hachijo town during celebrations in November. Starting with the Hachijyo project, JTB is planning to promote the use of renewable energy combined with tourism business to support the building of environmentally friendly and tourism-centered towns.